2016 Several seasons have gone by and the engine is solidly performing great, steaming well, with no major mechanical issues. It's a solid engine design and Bill and I could not be happier with it. September 2014 Engine and new Tender ply the tracks with much success. A couple issues pop up which we address. October 2013 Several more runs at the SLLS track and Big Creek & Southern reveal a fine running engine. Also pictures of the first fire-up of Frisco 4166 September 2012. First throttle pull at the St. Louis Live Steamers track. A three-day break-in run at the Big Creek & Southern and last run for the season. At the time, I used a borrowed tender from a friend (still needed to build one). Completed! Pictures, video and the Saga of the main drive wheels. 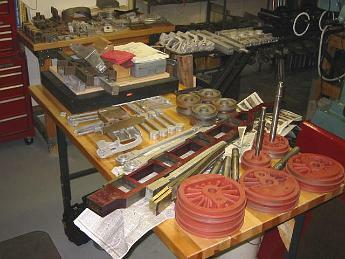 Started July 2005, finished December 2007 with a break in the middle to find, move and restore a bigger lathe. Completed! 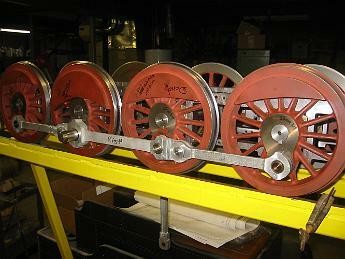 Locomotive Brakes. 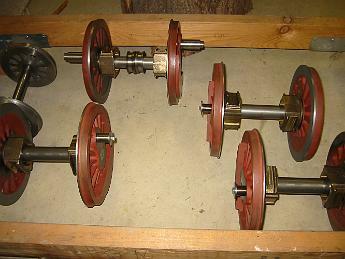 Brake cylinder, brake hangers, brake shoes, connecting links and beams. Jan - Feb 2008 The Brake gear was welded in August. I have received three replacement brake hangers and we completed them June 2009. Completed! February 2015 - Running Boards and ladders. Finished enough to Run! The 'face' of a locomotive. 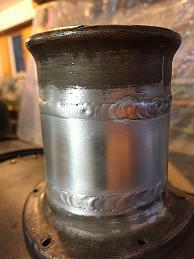 Front-end work in progress - Throttle, petticoat, blast pipe. 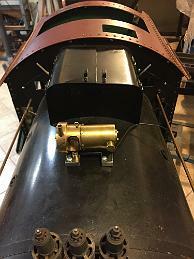 Custom smokebox support stays completed (Frisco used 4 stays, not the 2 like the USRA models), throttle modification and installation, a custom flaring tool - Winter 2011. Smokebox front, smokestack, headlight bracket, hinges, bell. February - June 2009. Plumbing May 2011 - finished Nov 2011. Completed. 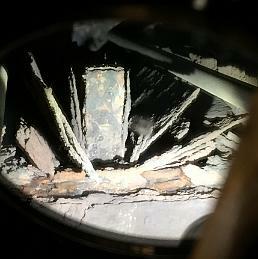 The boiler was fabricated by a machine shop in the hobby in 2003 and was part of the castings and prints when I purchased them from an individual. Completed! The Cab. September 2014 - Cab roof in Frisco Red Oxide, cab lighting. 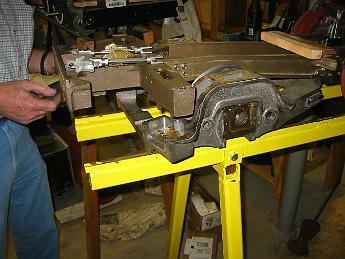 August 2012 - Fitting and modifying the stock USRA cab to be more like a FRISCO. August 2011 - Right now we are focusing on the minumum needed to get the locomotive running, cab finishing and details will come later. May 2011 - Cab Floor Started. 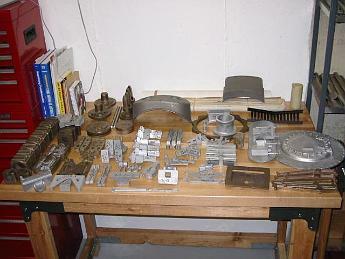 June 2008-Check out the beautiful laser cut parts my friend Tim M. hooked me up with! Completed! Cab Accessories. Should be called the plumbing section! 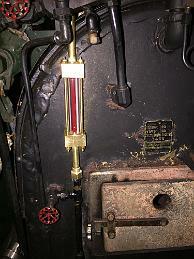 2014 - We make a steam vacuum ejector for the train brakes, lubricator for the brake stand. May 2012 - Minimum required plumbing completed for first fire-up. The manifold, main steam valves, accessories and controls all need to be plumbed in this section. The reverse stand is nearly finished (Aug 2011), Johnson bar. Plumbing completed for: Manifold; Blower; Main Steam Gage; Water Glass, Aux Air Manifold. Injectors are next. Usable! Tender Trucks. 2014 - The trucks have been finished, assembled and painted enough to be runable. 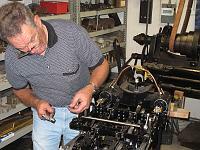 We did not design and fabricate the dozens of small parts to put operation brakes on them. We will do that later. Happy to report the trucks work great and have not given any issue running over the track. 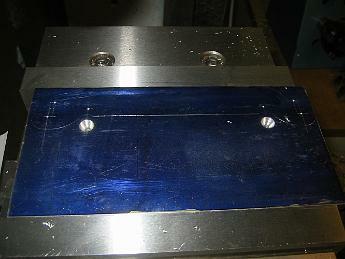 July 2013 Axle box machining in progress. June 2013 Back from being welded into a contiguous piece, Bill finished the machining of the Frames. Construction Started December 2012! I picked up a set of 3-axle commonwealth trucks in November 2008 which I will use instead of the supplied USRA bettendorfs. 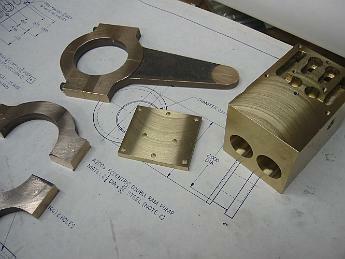 One problem: the homemade castings do not have an engineering print with them. I had to make prints and Bill had to figure out how to machine them. Completed! Tender. 2015 Added the "doghouse" - the brakemans shack to the tender deck, a unique Frisco detail, and backup light. 2014 - Finished over the winter and in service! Some detail work remains. 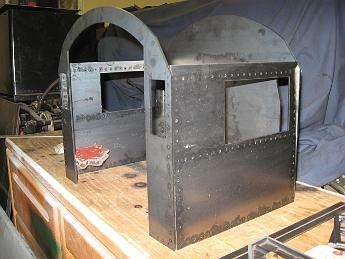 The July 2013 Assembly continues, riveting and welding are in progress. I have already learned one lesson: Cut the tender frame to length AFTER the tank is made. Maybe you will do better than I did, but my tank is a about 1" shorter than planned-making accurate bends in the sheet sides is hard! After using a borrowed tender for the first fire-up of the locomotive, all attention is turned to fabricating one this winter. November 2012 - raw stock for Tender Frame cut. Steel side sheets for tender tank laser cut. Fiberglass Tender received 2003. June 2009 - I am thinking of making a tender instead of using the fiberglass one since the 3 axle trucks I have will not fit under the frame. Misc. Stuff that doesn't have a particular home. Like the Lubricator. And hand rails. And a Bell, and whistle, and lettering, and couplers, and....and...and all that other stuff.